I'm not afraid of dying. Not one single bit. I don't sit around and dwell on it, or anything, but I've certainly thought about it in the past. All the horrible and/or peaceful ways to die. And none of them bother me. You know what bothers me? I mean, really keeps me up at night? The thought of anyone I love dying. I have mild anxiety all the time, but sometimes it goes into full-blown ATTACK mode (which I've described to you more than once, so I'll spare you the agony right now.) Suffice to say that one of my triggers for anxiety attack is 'the phone call'. I always expect that, when the phone rings, death and destruction will be on the other end. Someone's in the hospital. Someone's dead. Someone's been in an accident. Granted, all of these different phone calls have occurred in my life at some point in the past, but you wouldn't think it would strike such an impending doom within my heart that I actually anticipate that EVERY single phone call is going to be that way when I answer it. It very rarely is. And then, sometimes, it happens. Two weeks ago on a Friday night, just after finishing up a nice dinner out with a couple of friends, I got a text that I needed to call my mom. Already feeling the uncomfortable doom settling in my stomach because it was so late, and no text or phone call that late is ever a good thing, I went into full-blown anxiety attack when I saw that my husband also got a text to have me call... meaning, something bad was happening. In fear and overwhelming nausea, I dialed my mom's cell phone to find out that my little sister was in the emergency room. I needed to come right away. She didn't say that. I just knew it. Driving ten miles over the speed limit from Middlebury to Mishawaka (about 35 miles), I got into the ER where they were giving my sister a CT scan and setting up a blood transfusion. There are 16 years between us, so she is young and small and always looks frail because of her anemia, but seeing her in such tremendous pain, her face a ghostly pallor, I couldn't help but think the worst. I let my fear overcome me that night and the next... but I'm uncertain as to whether or not it showed on the outside, because so much is a blur and I can easily portray 'calm' when the inside of me is in turmoil. I do it on a regular basis. On Saturday, I made the mistake of going home to attempt sleep for a few hours. When I woke, a frantic call from my dad, in a tone I'd never heard before, threw me back into the car (this time, my husband drove) because he said these words: "She might not make it." Nothing in my life has ever given me cause for such fear -- such atrocious, screaming, agonizing fear -- as hearing him say that. I don't even recall the rest of the conversation, or what he was attempting to describe to me. I did what I always do in times of stress and trouble and uncontrollable outcomes. I did what almost everyone does in that situation. I prayed. I prayed, and my husband drove, because I never would have made it to the hospital alive myself in the emotional blitzkrieg I was standing in. Over the course of the next several days, my sister went back and forth in agonizing pain, through pokes and prods and needles and ports and blood-taking and blood-giving (four bags of blood for a transfusion!) and pain medication and dizziness and nausea and anxiety and so, so much more nightmarish trauma, but something happened inside of me during this period of time. I went from the crippling fear of losing her and praying for God to save her to a completely different kind of prayer, one that a close friend of mine has been talking about for a very long time. I've never fervently prayed before. I've asked, I've begged, I've harangued, I've pleaded, I've nagged, and I'm fairly certain I've annoyed God before to try and get what I want and/or think I deserve. But never have I given myself completely over to His will and boldly sought Him out while I believed, wholeheartedly, that He would do something. The Bible tells us that faith as small as a mustard seed will be able to say to a mountain, 'Move!' and it will move. (Matthew 17:20). There's always something in the back of my mind that doesn't really believe that God WILL do something. I figure, Oh, if He wants to, He can... or He might, if I pray hard enough. But praying WHILE believing Him to do exactly what I'm asking Him for? Never tried it. Never felt it. Quoting scripture in my head while begging for a miracle? Never tried it. Never felt it. This time, I felt it all. I prayed over my little sister in the midst of her pain and fear, out loud, reassuring her that God would take control and He would heal her and take her pain away. 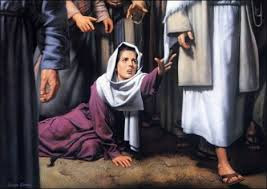 I prayed in my head to God, telling Him what I remembered in the New Testament about how the woman in Matthew 9 believed so strongly in His healing powers that she knew if she only touched His robe, she would be healed. I kept saying to God, over and over, "I'm holding onto your robe right now. I know that you will do this." I texted friends to pray the same things I was praying, and they texted more friends. I prayed for Him to take her pain, take her fear, give her good nurses and doctors, and to heal her so well that she would feel better when leaving than she ever had in her entire life. And I believed that He not only WOULD do it, but that He was in the midst of doing it even as I spoke or thought the words. I have to tell you that this is a tremendous turning point in my life. When I say something changed in me, I very literally mean it. I could feel something inside of my heart 'click'. My fear left. I was sad and hurting for her during her bouts of pain, but I had a fresh feeling inside that it would all be over soon -- in a GOOD way -- and that we would all be changed for the better when it was. My prayers became second nature. For the first time in my life, I acknowledged that I had no control over the situation, but that I had a great relationship with the One who DID have control over it, and I knew He was listening. My sister is home. Yesterday, six days after her discharge from the hospital, she walked nearly two miles, completely energetic, color in her face, up and down hills and stairs and my mother and I could barely keep up. And what did she tell me today? She feels better than she has in years. God is here, and He is listening. Talk to Him while we walk together, friends, and believe every word He says. He will change your life. This...is the good stuff...what an amazing and powerful affirmation! So glad you are well. Savannah! Thank you Stefanie and Savannah for sharing your stories. I feel very uplifted right now and I've had a rather down day. May God bless your both! Thank you so very much for reading, and for your kind words. I'm so pleased that God led you to read this, and I certainly hope your days have improved since. My prayers are with you for whatever sort of healing you need in your life. Thank you for being on this Journey with us! This is a beautiful story. I was also praying during that time. I know you were, and I appreciated every single prayer more than people can imagine. THANK YOU, Jeannine.